With Christmas less than five weeks away, it’s time to get your gifts bought and ready to go. Luckily, the museum’s got your back. Each week until Christmas we’ll bring you a gift idea bound to impress the loved/liked/acquainted/not–a-big-fan-of-but-obliged-to-get-them-a-gift-anyway person in your life. We begin with a holiday classic: Jewelry! Have you ever looked at your jewelry and thought, “This is pretty, but it really doesn’t do much to take advantage of my depth perception?” Canadian designer Elizabete Ludviks has created a line inspired by her Scandanavian and Baltic roots. If your significant other is a fan of modern design, shiny things, and geometry, this is the perfect gift. 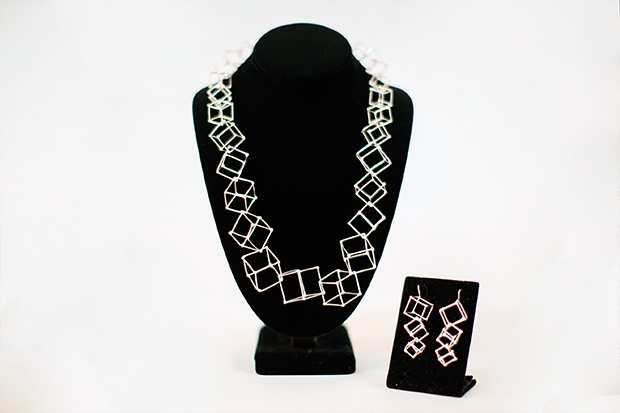 The handcrafted sterling silver necklaces, pendants, and earrings are available at the Museum Shop and Spalding House Shop in cube and triangle shapes. Our shop regulars have already discovered these, so supplies are limited, but we’re continually restocking. If you don’t find what you want on your visit, talk with our shop staff about the next shipment. You can also email our shop manager Cori Mackie at gro.muesumululonohnull@eikcamc for more information. Need more gift ideas? Head to the Art School Holiday Sale this week to browse the ceramics, jewelry, glass fusion, and textile works created by our students and instructors!